We’re proud to announce Accel’s $40m Series A investment in VSCO, a leading mobile photography platform and creative network. Among the many reasons we invested, nothing speaks more to our excitement than the raw creativity VSCO fosters on its platform. Browse their site, flip open the VSCO Grid or search “#VSCO” or “#VSCOcam” on any number of social networks, and you’ll find some of the most beautiful, emotive photos and images on the web. Around the world, millions of mobile photographers are tapping the VSCO app to capture, edit, and share their most vivid shots, over and above the legions who use their professional desktop tools. Here’s a great video — VSCO x Accel — to get a feel for the “movement” brewing on VSCO. For us, VSCO follows a long line of investments in companies powering the creative web — we love entrepreneurs who enable and inspire through great products and user experiences. With companies like Etsy, Squarespace, lynda.com, Prezi, Campaign Monitor, Atlassian, Pixate, Dropbox and others, we’ve long sought-out and backed businesses that support creatives at all phases of their lifecycle — from creation through distribution. With some, like Squarespace, Prezi or Pixate, it’s about giving artists the tools to put “pen to paper” on their most high-impact ideas, collaborating freely and delivering beautiful output. With others, like Etsy and lynda.com, it’s about powering the networks to distribute creative work; generating a vibrant community for learning, sharing, and value-add feedback. So, it’s hard not to love a company like VSCO where great tools and a passionate community collide. VSCO had long been the gold standard in photography with their desktop post-processing and workflow products (there’s probably a good chance your wedding photos were finished in VSCO Film). And they’ve since expanded to become one of the leading mobile photography apps with VSCO Cam, taking what they’d learned building for the “pros” and bringing world class tools to the palms of the masses via the mobile device. Moreover, millions today post their images to the VSCO Grid, a fast-growing social community who celebrate and curate great photography. 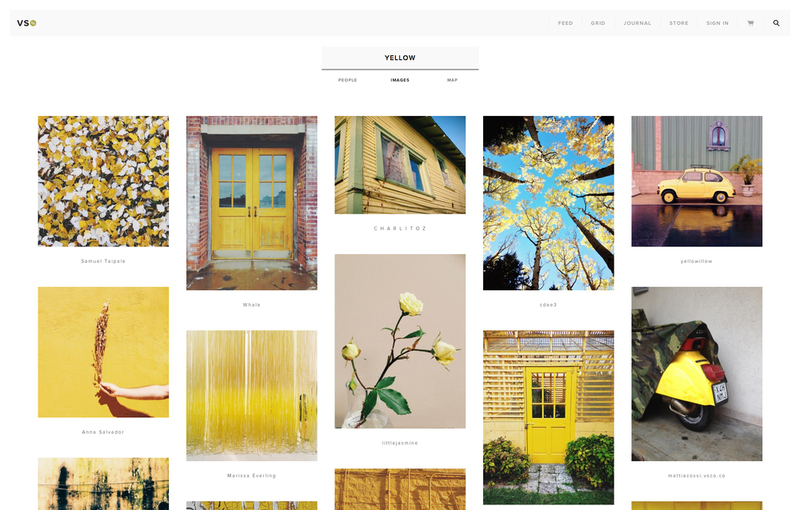 Hop over to grid.vsco.co and you’ll get a beautiful, real-time view of the world through the lens of VSCO users. Building this platform has, not surprisingly, timed nicely with the rise of the mobile creative, who are taking to smartphones and tablets to not only consume, but also to create. Each day millions of potential photographers come online with new, powerful mobile devices — hardware which long ago swallowed the point-and-shoot camera, and is fast approaching the capabilities of the DSLR. They enable real photographers to forgo expensive equipment in favor of the portability and flexibility of a smartphone, while making a “photog” of the rest of us. Throw in a simple data-connection and you’ve enabled creatives to capture and share at a moment’s notice, layering in rich context and meta-data to beautiful imagery. It’s no secret users are fanatical about the VSCO brand — ask any (we did! ), and they’ll instantly recognize it as the best way to produce and share rich, emotive images, and are proud to be associated with the name. Today, we’re proud to officially be a part of VSCO as well! Team is such an important ingredient for any investment we make, but particularly so in the creative space. We first met Joel, Greg, Mike, Wayne and the rest of the VSCO team as the company was scaling quickly, having bootstrapped profitably since their founding in 2011. We loved their community-first mindset — and were struck by how focused they were on preserving the authenticity of the VSCO experience. Every decision the team makes is with their user’s best interests in mind, a philosophy that permeates everything from hiring to customer support. With their “product-first” mentality, they build the tools that they want to use themselves, resulting in elegant products that largely sell themselves. To date, VSCO has scaled to nearly 50 employees, millions of domestic and international users, and billions of shared images entirely through customer-funded working capital and user-generated creative capital. This round of financing will go towards building even more tools and services for the VSCO community and adding great people to the VSCO team. The founders have a big vision for the platform, and with this investment, can finally match the passion and energy of a user-base that’s grown non-linearly from the start. The company is also announcing a significant expansion of its Artist’s Initiative, a grant-based program that supports artists and their mission-driven creative projects across the world. We’re looking forward to seeing this community grow over the next few years, and are thrilled to be joining the VSCO team as a partner on their amazing journey!